Nick Gilson, Steve Blackman and WeBeGB tour mascot Ollie prepare for a day of hard work. Gilson saw that the decreased surface of the dual hulled boat traveled faster through water than a single hull with a larger surface area. He wondered if a reduced surface on the base of a snowboard would give him the advantage he needed on the snow. He tested his theory during an independent study class. Using his dad’s shop he built a press and created a board. “It was a total joke, I was in eighth grade and didn’t know the first thing about what I was doing,” laughs Gilson. Nick Gilson and Adam Vanderhyden work together on a new board design. Fast forward to Gilson teaching science at New Visions Academy in Nashville, Tennessee. With the help of Austin Royer—the only other science teacher at the fledgling charter school of fifth through eighth graders—Gilson revisited his experiment as a summer project. The goal was to create something that had the potential to break speed records. The two began by clearing out a small basement and building a shop. Using materials from the local Home Depot, they experimented with building a pneumatic press that was capable of providing the pressure needed to manufacture snowboards. After a few iterations they came up with a machine that cranked out the first five prototypes. 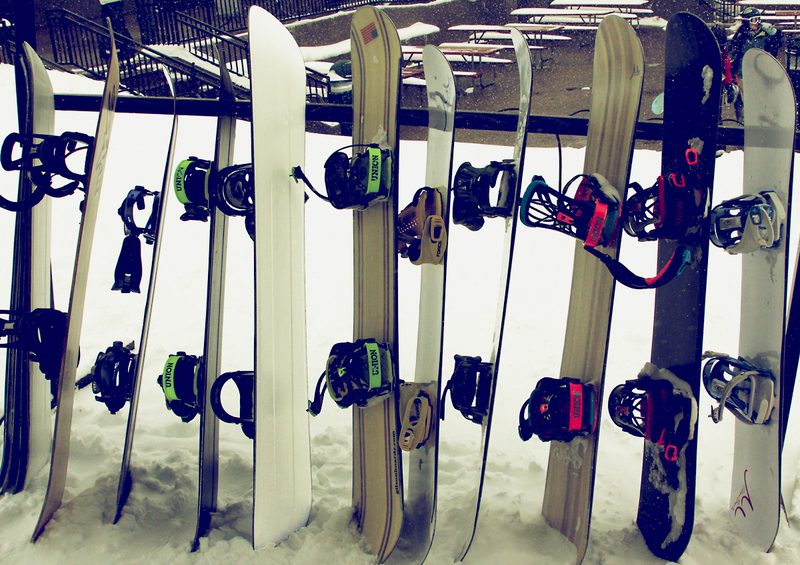 In December of 2012, they tested the first boards during a trip to Colorado. Gilson describes them as abysmal. Heavy and stiff, they weren’t fun to ride and didn’t come close to breaking any records. Yet Gilson rode the boards for the rest of the trip despite his trustworthy, traditional snowboard waiting at the bottom of the hill. Though the engineering failed, he remained intrigued by the design. Gilson and Royer moved into a cabin with no electricity or running water on Royer’s family farm in rural Pennsylvania. 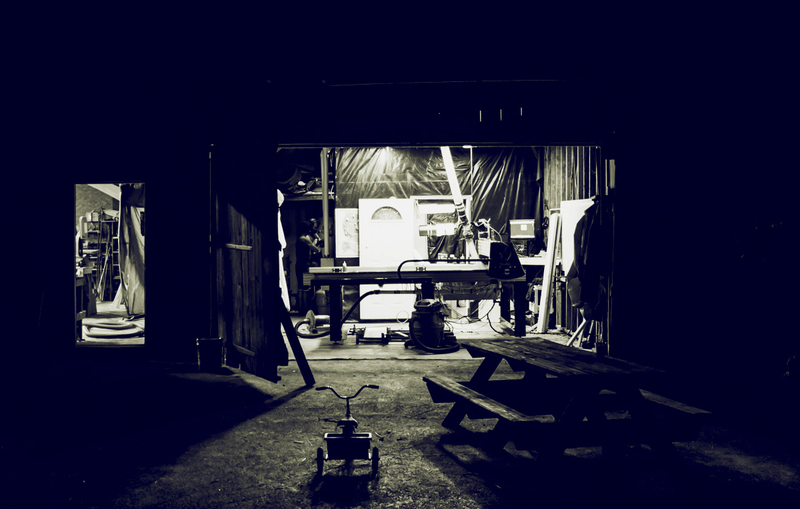 The duo began building snowboards in a barn alongside horses and donkeys. Gilson and Royer were able to bring the boards into the classroom as a hand-on project for students to test their own theories on the relationship between surface area, friction, and velocity. They tweaked the design—then tested it and tweaked it again until they came up with something that featured two raised planes along the outer edges of the base. This design also lifted the metal edge of the snowboard off the snow just slightly. They knew they had something different. Danny Jones and Nick Gilson consider their latest design. Not only did the raised edge stabilize the board when riding on a flat base, but it also created a secondary soft edge that allowed the rider to drift and smear turns without engaging the metal edge to initiate a carved turn. At an impromptu demo day back in Colorado, the boards received rave reviews. The vision changed. Not only were they trying to create a viable product, they were also going to build a company. Gilson and Royer moved into a cabin with no electricity or running water on Royer’s family farm in rural Pennsylvania. The duo began building snowboards in a barn alongside horses and donkeys. After clearing out the barn, they redesigned the way they pressed boards. They needed a way to ensure each board had a precise and consistent profile. Gilson Boards operates out of a small barn in Winfield, Pennsylvania. Gilson consulted Adam Vanderhyden, who had a background in Computer Aided Design and Computer Programming. Vanderhyden wrote the algorithm that decides whether a transaction is accepted or denied whenever someone swipes a Discover card. Needless to say, Gilson and Royer were excited to tap his expertise. “The theme of all this seems to be ‘No, I don’t know how to do that but we’ll figure it out,’” said Vanderhyden. Unsure of the solution he began researching 3-D CAD until he was frustrated to the point of almost giving up—and that’s when it clicked. Soon they were able to manufacture boards at a much more efficient and cost effective rate. The trio found that their boards were not only faster than a traditional snowboard, they were also stronger. Furthermore, the unique construction of the boards helped them shed weight and provided an enhanced flex pattern. They tweaked the design—then tested it and tweaked it again until they came up with something that featured two raised planes along the outer edges of the base. This design also lifted the metal edge of the snowboard off the snow just slightly. They knew they had something different. After creating the product, they needed capital. That’s where Jared Brett, a fellow teacher from New Visions, was able to bring his perspective. As the founder of Sound Logic, an electronic music distribution company, Brett brought his experience of building a company to Gilson Boards. Soon they were attracting investors. Although the initial interest was in what the team had accomplished in a few short months more than the product, it meant that Gilson Boards was able to grow. The first step was to hire and train enough employees to run the factory. Then Gilson purchased the Airstream trailer that has became the identifying mark for the company. The company began offering a small selection of boards for sale at Gilsonboards.com. Kevin Saylor jibs the Airstream. 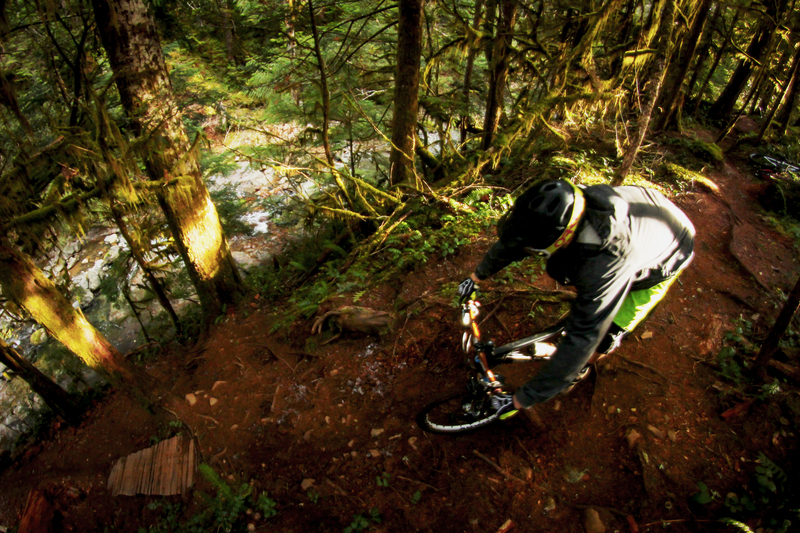 In December of 2013, a crew of friends and riders hit the road on what they called the WeBeGB Tour. 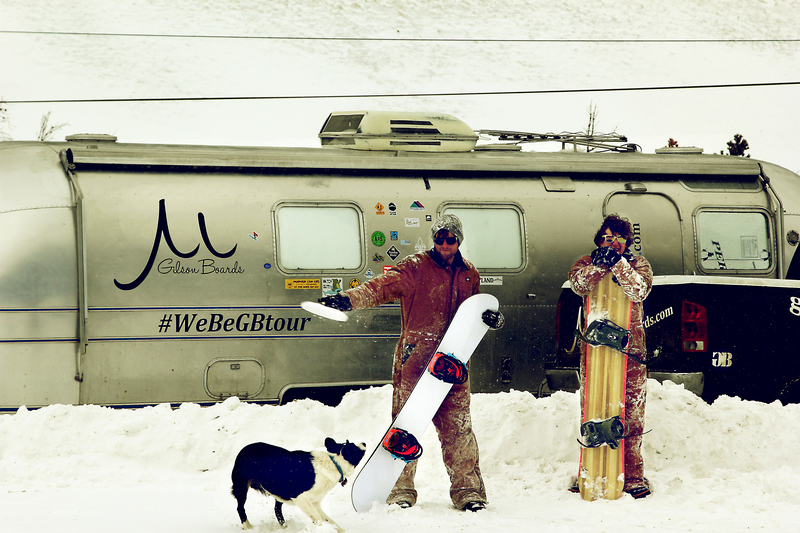 The crew simply aimed to introduce Gilson Boards to mountains across the nation. Steve Blackman joined the group to document the whole trip. If this grassroots marketing and research campaign sounds familiar, perhaps it is—it’s how Jake Burton introduced snowboarding to skiers and resorts across the country. While traveling through California, the crew picked up Danny Jones. Impressed by his passion for snowboarding, the friends invited him to join them for a weekend at Mammoth—and then he never went home. With a background in the snowboard industry, Jones now helps the company build relationships with shops and resorts and gain more exposure. All set up and ready for demo. Whether at Jay Peak, Jackson Hole, or Mammoth, testers at demos have enjoyed riding Gilson Boards—they’ve also shared plenty of positive feedback. The brand is also enjoying increasing sales while continuing to refine its designs to match diverse riding styles. This summer, the brand is moving to a larger production facility in order to meet a growing demand. “If everything goes right, hopefully this works out and we can bring new technology to people who are on the mountain every day,” explains Vanderhyden. We’re excited to see what the future has in store. 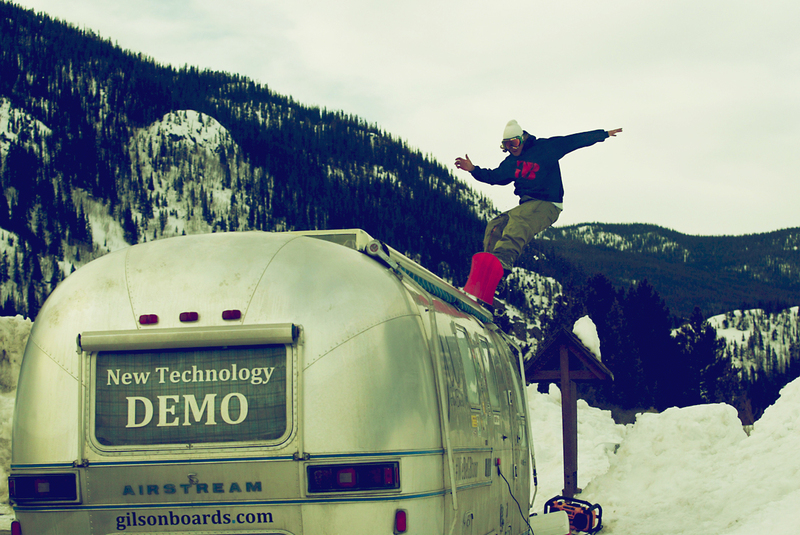 Look for the Gilson Boards Airstream at resorts this coming winter for a chance to demo the brand’s decks or drop into gilsonboards.com.